The Lebanese film Capernaum was made with a cast of non-professionals playing characters whose lives closely parallel their own. Following her script, Nadine Labaki placed her performers in scenes and asked them to react spontaneously with their own words and gestures. When the non-actors’s instincts diverged from the written script, Labaki adapted the screenplay to follow them. Winner of the Grand Jury Prize at the Cannes Film Festival, Lebanese filmmaker Nadine Labaki’s Capernaum (Chaos”) tells the story of a Lebanese boy who sues his parents for the “crime” of giving him life. Capernaum follows Zain (Zain al Raffea), as he journeys from gutsy, streetwise child to hardened 12-year-old “adult”: fleeing his abusive, negligent parents, surviving through his wits on the streets, taking care of Ethiopian refugee Rahil (Yordanos Shiferaw) and her baby son Yonas (Boluwatife Treasure Bankole), being jailed for a violent crime, and finally, seeking justice in a courtroom. Although it is set in the depths of a society’s systematic inhumanity, it is ultimately a hopeful film that stirs the heart as deeply as it cries out for action. When Labaki came home, she drew the face of a child with his mouth agape, shouting at group of adults standing in front of him. She captioned it: ‘I’m sorry! I quit! I don’t want to be here! I don’t belong in your world! I don’t want to breathe, eat, play, learn, laugh or dream! I don’t want to grow up to become like you! You have failed me!’” Although Labaki had not begun writing the script for Capernaum , her drawing looks eerily like Zain Al Rafeea, the boy she would eventually cast as her lead. While this idea sparked Capernaum , it wasn’t the only inspiration. “Lebanon was filled with refugees at that time, and you could see kids on the streets everywhere,” says Capernaum producer and composer Khaled Mouzanar, who is also Labaki’s co-writer and husband. Mouzanar, who collaborates with Labaki on her scripts, started brainstorming with her about the things that bothered her most, and encouraged her to write them all down on a whiteboard. Labaki understood that if she was going to voice the concerns of these lost children, she had a lot of learning to do. Along with Mouzanar and her co-screenwriters Jihad Hojeilly and Michelle Keserwany, Labaki started visiting some of the darkest places in Lebanon: children’s detention centers, prisons for minors, and courtrooms. When she felt she had enough investigation behind her, Labaki began writing with Mouzanar and co-writers Hojeilly and Keserwany. Hojeilly is a photographer who Nadine became close friends with when they were film students at Beirut’s Saint-Joseph University and has collaborated on the screenplays of all her subsequent films. Keserwany is a socially committed artist and singer/songwriter, who makes music videos performing with her sister Noel. It was from these conversations that Labaki developed the film’s central premise of a boy suing his parents for giving him life. Legally speaking, this is not something that can actually happen in Lebanon, as a child can’t sue his guardians. Still, Labaki felt that this storyline was essential. Having spent so much time with the real people that she would be portraying in Capernaum , Labaki decided that she couldn’t make the film she envisioned with professional actors. Labaki’s starting concept was to give her cast the basic outlines of a scene and let them take it from there: use their own words and gestures, say whatever they feel like saying, and not limit themselves to where the scene was supposed to go. Mouzanar realized that Labaki’s vision could not be accommodated by a conventional film production’s approach, with a set shooting schedule, planned locations, and budget. She would need to take as much time as necessary to get the performances she wanted out of her cast, as well as the freedom to shoot when and wherever she wanted to shoot. Capernaum himself, even though he had never produced a film before. Gradually, Mouzanar secured funding with a bank and persuaded numerous producers to invest. As there was over 500 hours of footage shot during the six months, the editing took a year and a half to do. The first cut was twelve hours long. A lot of the most interesting parts of the story had to be removed as Labaki and editors Konstantin Bock and Laure Gardette painstakingly carved the movie down to feature length for its showing at Cannes. A production process like Capernaum ’s could never have been conceived before the age of video, where the cost of rolling cameras for six months is relatively insignificant compared to all the other costs of production. 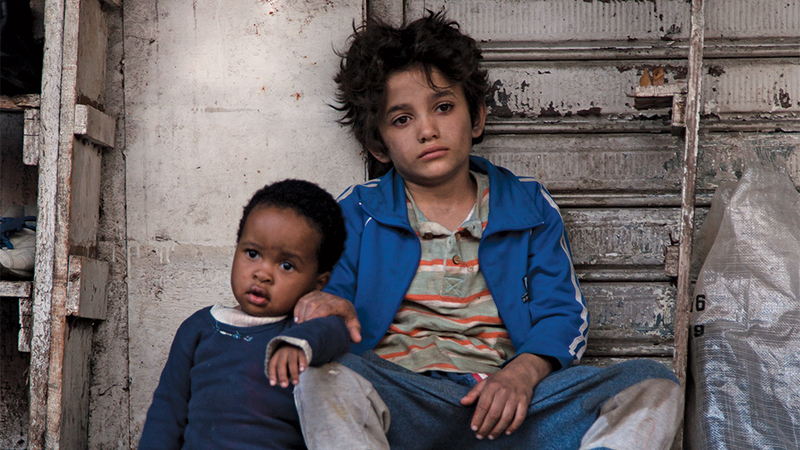 Capernaum may be set in Lebanon, but its concerns are global. “When I started plunging into this universe, I changed my perception of what the film was,” says Mouzanar. Labaki is hopeful that Capernaum can increase awareness and open up a debate about the conditions of these children. “The problem is that we don’t want to acknowledge it because the issue is so huge that we don’t know where to start,” she says. NOTE: The film debuted at the 2018 Cannes Film Festival, where it was selected to compete for the Palme d’Or. The film received a 15-minute standing ovation following its premiere at Cannes on 17 May 2018, and won the Jury Prize. It was nominated for the Academy Award for Best Foreign Language Film at the 91st Academy Awards, among several other accolades.